"The psychological challenges and unraveling events provide suspense, as well as deep introspection and boundless material for contemplation that will keep readers busy long after they turn the last page. Highly Recommended!" The Columbia Review. 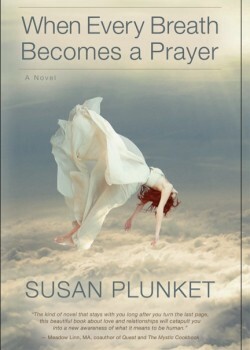 “When Every Breath Becomes a Prayer” is an ambitious new novel by Susan Plunket. At its center is Georgina, a passionate, worldly woman whose life is rich with emotional attachments and the consequent conflicts, sorrows, and perpetual fears of pending tragedy. Her lovers’ betrayals and, more than anything, her daughter’s suicidal depression, make for intertwining plotlines created from the stuff of real life. This is a novel filled with multifaceted characters whose actions and motivations ring true. Georgina’s circle of close friends and confidants, the men in her life, and Kate, her troubled yet wonderful daughter, are three-dimensional and humanly flawed, as flesh-and-blood as living people. Another central character in the novel, one that’s no less alive than the human players, is New York City, which all readers—either lovers or detractors of the Big Apple—would agree plays a crucial role in giving this story a wonderful boost of emotional authenticity. Take this, for example: “It was dusk. The leaves were blowing overhead, and there wasn’t much traffic on Fifth Avenue. Georgina suddenly felt all alone in the world.” Not only the succinct description creates a familiar image wholly fitting that particular moment in the story, but also, the subtle irony would not escape the reader, who knows how the absence of traffic on Fifth Avenue in New York City could make one feel alone in the world. In summary, “When Every Breath Becomes a Prayer” by Susan Plunket is a wonderful story that readers—both women and men—would enjoy and remember. The author manages to bring a fascinating cast of characters to life, which is not only real and authentic life with all its ups and downs, but also a spiritual life that sustains the characters—and us—in times of hardship, anxiety and pain. The psychological challenges and unraveling events provide suspense, as well as deep introspection and boundless material for contemplation that will keep readers busy long after they turn the last page. Highly Recommended!